In large bowl, beat cake mix, pudding mix, milk, oil and eggs with electric mixer on low speed 30 seconds. Beat on medium speed 2 minutes, scraping bowl occasionally. Stir in mashed bananas and 2 cups crushed cookies. Divide batter evenly among muffin cups. Bake 25 to 30 minutes or until toothpick inserted in center comes out clean. Cool 10 minutes; remove from pans to cooling racks. Cool completely. Frost cupcakes with whipped topping. Sprinkle with 2/3 cup crushed cookies. 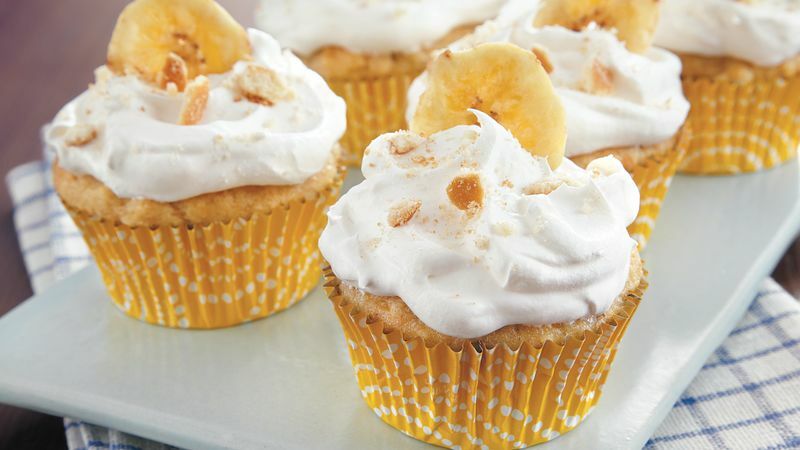 Top with banana chips.